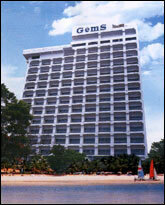 Gems Cha-Am, An affordable, luxurious and relaxing hotel next to Cha Am beach. More than 105 Rooms are located in this 18 storey high hotel that give you great views of the beautiful Cha Am beach. Gems Cha-Am boasts every modern facility including Dining Rooms, Conference Rooms, Bar, Karaoke, Exercise Rooms, Sauna and Rooftop Swimming Pool. We will ensure that this will be the most memorable vacation for you and your family. Each of the 105 luxurious guest rooms enjoy superb sea views from the privacy of guest room balconies. Capacity 40 Seats, Open daily from 11.00 a.m. till 12.00 p.m.
Busaraka Restaurant Service an A La Cart Menu and sumptuous buffets featuring both Thai and Western delicacies. Capacity 140 Seats, Open daily from 06.30 a.m. till 11.00 p.m. The perfect place for drink at any time in front of Gems Cha-Am Hotel. Capacity 120 Seats, Open daily from 10.00 a.m. till 11.00 p.m. Located on the 3rd Floor. Open daily from 07.00 a.m. till 09.00 p.m.
On the 17th Floor, overlooking the Gulf of Siam and with majestic views of the beach and pinetree forest, is our Health Floor featuring a gym with a full range of modern exercise equipment, sauna, jacuzzi and outdoor swimming pool. Conference and Seminars are will catered for with the hotel's impressive facilities, which include a ballroom with the capacity to cater for over 200 guests and two additional muti purposes banquet rooms. Special functions can be tailor made to meet the individual requirements of every client from audio-visual presentations, product launches of company training weekends to birthday parties and wedding receptions. The hotel's experienced and professional banquet teams are on hand to assist with planning and smooth excution of each event.